As promised a couple of weeks ago, after making the Egyptian Tiger Nut Sweets, I found a recipe to make Brazilian Brigadeiros with the girls. This is probably the best known Brazilian sweet, always found at children’s birthday parties and family celebrations. Its origin dates from around the time of WW2, when access to fruits and sweets was rather limited. People got creative, so using condensed milk (introduced to Brazil in the 20’s), cocoa powder and butter they concocted the now famous bite-sized fudge ball. The sweet got its name after Brigadier Eduardo Gomes, a hero of the Copacabana fort revolt of 1922. He ran for president in 1945 under the slogan “Vote for the Brigadier, who’s good looking and single.” That was the first time women voted in Brazil, but unfortunately for the Brigadier, the only thing he won was a very popular sweet. I looked for several different recipes, and mainly they all come to these basic steps: cooking sweetened condensed milk with butter and cocoa powder, then waiting for the mix to cool off and then rolling them into small balls that are then covered with chocolate sprinkles (or other type of cover, such as coconut, nonpareils, etc). I decided to try out and make ours with the ingredients I like. So, here’s our recipe for Dark Chocolate and Nutella Brigadeiros. Bite-sized chocolate very sweet truffles. A chocolatey bomb that explodes in your mouth! In a heavy pot pan, pour the sweetened condensed milk and place under medium-low heat. Once the milk is a little warm, blend in the chocolate powder, then the butter. Continue to cook, stirring constantly, until you can see the bottom of the pan for at least 3 seconds, before the mixture covers it again. Remove from the heat and add the tablespoon of Nutella, stirring to combine in the mixture. Spread the chocolate mixture in two buttered flat dishes, and let it cool for about 10 minutes, until you can handle it with your hands comfortably. Using a 1/2 tsp measuring spoon buttered as a guide, scoop out the mixture and work it with buttered hands into a ball. Dredge the ball on the chocolate sprinkles, and you just made a Brigadeiro! Place in individual bonbon cups, or just leave on a plate. Cover with plastic wrap if you are not going to eat immediately, or place them covered in the fridge. This time I also tried to find a good book on Brazilian Folktales to recommend and go with these delicious chocolatey nuggets. I found Brazilian Folktales by Livia de Almeida and Ana Portella, which is a pretty large collection of many Brazilian Folktales throughout Brazilian history. It has a fabulous prologue where it talks about the word of mouth storytelling tradition of Brazil. It also talks about how the native Brazilian, European and African traditions have been blended and shaped into what now is Brazilian lore. The story I chose for this class was The Star Fate of the Bororo Boys, which tells a story of how a bunch of little kids end up going to extremes in order to eat sweet things intended to be tasted by grown men only — and end up turning into the stars high above, in order to escape punishment from their mothers. You can read the prologue and see a free sample of the book by clicking on the book’s cover. I also found another website with stories and tales from around the world, with some of the traditional Folktales indexed in the book. You can read them here, at Fairy Tales and Folklore. So snuggle up with these fabulous Brazilian Nutella Brigadeiros and read this wonderful stories about how the world came to be according to Brazilian tales! You’re very welcome! Did u know that Brazil.com featured the recipe with links to both of us? I was very excited! Thanks for stoping by and I absolutely adore your Brigadeiro picture! Ok. I’m coming over. I need to try these!!!! Thanks, Helen! I’m honored! I’ve been missing the #FoodieFriday, so I’m glad to be back, and featured too! Thanks, and let me know what you think of them when you make them! I love the idea of reading a book and making something that goes with it! 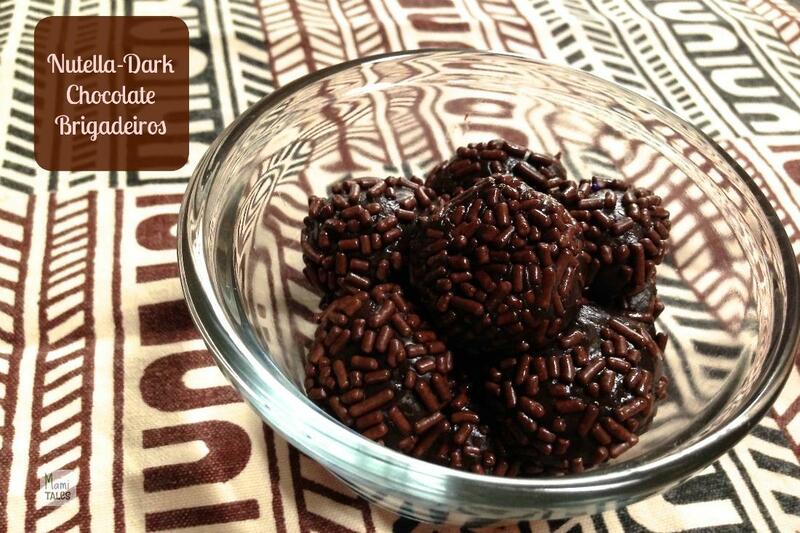 These brigadeiros look delicious! I may have to try this book/dessert combo with the kids!